When the first Star Wars movie was released, the special effects done by ILM set a new standard. The people responsible for these effects won many awards over the years, including an Oscar for Raiders of the Lost Ark and a BAFTA for Return of the Jedi. One of the people that won these two awards is effects wizard Kit West, who was responsible for the mechanical effects in both movies. During his career -that spans five decades- he has worked on many popular movies including Dune, Stargate and Young Sherlock Holmes. The following interview (done in May 2010) is all about that career, how he got started and his two award winning movies. What got you into the effects business? Was it a movie, an experience or something else? On leaving college my first employment was as a trainee camera assistant with a documentary film company, Realist Film Unit, producing Government and Military training films. My national service (2 years) was spent in the army in Malaysia, and Singapore during which I experienced my first introduction to pyrotechnics, detecting booby traps and explosive devices. On leaving the army, I was re-employed by the same company but by now they had a branch producing cinema and television commercials. It was in the TV commercial world that I eventually became a DOP but also specializing in photographic effects. Later I joined a company owned by a feature Special Effects Supervisor, Les Bowie, and for many years I was his in-house cameraman, photographing elements for matte shots miniatures, and in camera photographic effects for feature films. It was whilst working at Bowie Films I took an interest in the practical and mechanical side of the special effects world, and started to learn the 'tricks of the trade'. 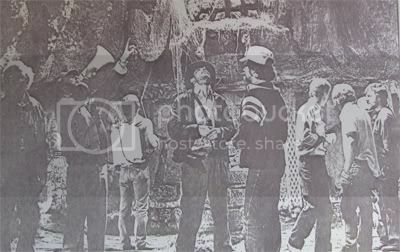 I was in 1964 that I was first credited as Special Effects Supervisor on a feature movie. How did you get approached to work for ILM? I wasn’t actually ever directly employed by ILM. I had just completed working on Raiders of the Lost Ark and it was at the film’s end of picture wrap party that George Lucas approached me, and offered me Return of the Jedi. I was directly employed by the movies production company - Chapter 3 Productions UK. You were the mechanical supervisor for Return of the Jedi. What was your exact task and how did your days look? After completing all the location reccees in Arizona and the Redwood Forest in California, I returned to my base at Elstree Studios in England and signed on most of my crew from Raiders of the Lost Ark. We prepared all the mechanical, atmospheric and pyrotechnic effects that were to be filmed on the sound stages in Elstree Studios, then concentrated on all the major mechanical rigs required in the States. 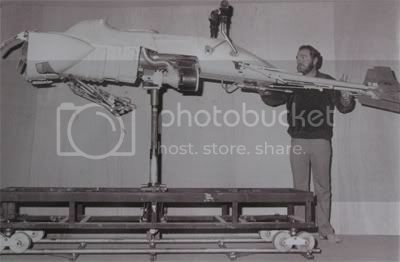 We built all the speeder bikes and their travelling and gimble mechanisms for shooting on location in the Redwoods, and the bluescreen shooting at ILM Studios in San Rafael. Also built in the UK was the hover skiff which floated over the Sarlacc Pit, next to Jabba's Sail Barge in the deserts of Yuma. This also included all the gimble support mechanism controlled by hydraulics. The animatronic tentacle which rises up from the bottom of the Sarlacc pit was also one of my tasks. The radio controlled R2-D2 and all the other robots made for the production were another of my responsibilities, both on the UK locations and in the States. 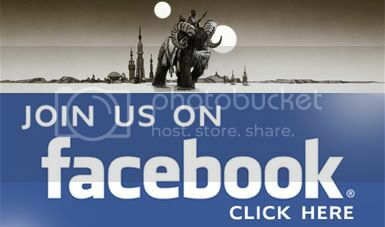 Which scenes from Return of the Jedi did you work on? If I’m correct one of the scenes you worked on was the speeder bike chase through the forest? I worked on every live action sequence during the shooting of Return of the Jedi, both in the UK and in the United States. In the UK I was assisted by my usual English crew, and in the US I had the cooperation of Roy Arbogast and his LA team. What difficulties did you experience working on Return of the Jedi? Was there any negative experience that stands out? I suppose I could say the excessive heat of the desert in Arizona, and the constant downpours of rain in the Redwoods made working conditions rather difficult, but nothing that I have not experienced on other shoots around the world. 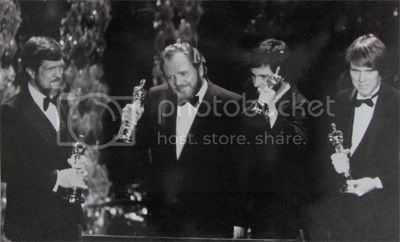 There were only maybe a couple of occasions when I found myself in between artistic difference from the director (the late Richard Marquand) and George Lucas the producer. As far as my memory serves me, the producers’ side usually won. Besides the difficulties: what were the positive points regarding working on Return of the Jedi? The positive side was of course that one was very aware that the production on which we were working on had tremendous potential with the success of the previous two Star Wars episodes. The crews in all departments were a joy to work with, meaning from the producers right the way down to craft services. Before Star Wars, you worked on another Lucasfilm production: Raiders of the Lost Ark, for which you won an Oscar. Can you tell something about working on that movie? For instance: which scenes did you work on? Once again, I supervised the physical, atmospheric, mechanical, and pyrotechnic effects, throughout the entire production. 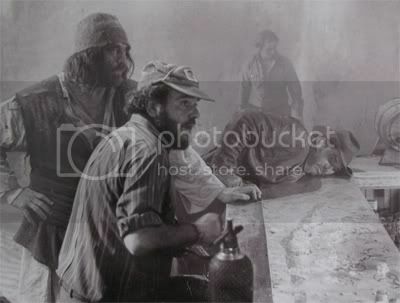 Again shooting the interiors on the sound stages at Elstree Studios in London, and the locations in Hawaii, France, and on the edge of the Sahara in Tunisia. This was my first time working with director Steven Spielberg, and although I found it very demanding I always had the feeling that his demands and criticisms were well justified, and also had the feeling we were working on a product which was to be successful. How true that was. You have worked with the legendary George Lucas and Steven Spielberg. What is in your opinion the one thing that really defines these two men? 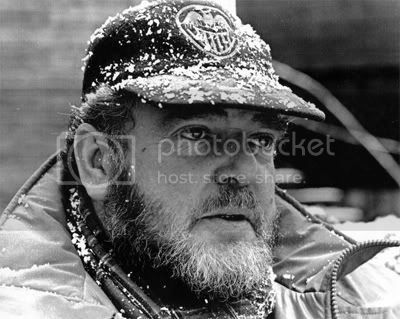 One must remember that I only worked with George in his capacity as a producer and never as director. With Steven he is usually wearing both hats, director and producer. They are both of course both Grand Masters of the movie business, and I have learnt so much from both men, taking knowledge and tricks of the trade with me on subsequent productions. I THANK THEM BOTH FOR IT. Since the mid 90’s CGI is taking over from the ‘old’ effects. I am always interested what someone who is in the effects business thinks about this. Do you think it’s good or bad that the old effects crafts are disappearing and computers are taking over? I would not say, for one moment, that the CGI industry is replacing the standard practical live action effects, if anything they are enhancing a lot of what I create. I am finding more recently that producers are asking me if I could come up with some of my old techniques, to try and keep some of the CGI costs down. The CGI departments on all shows I have been involved on have requested numerous practical 'elements' to include in their effects shots. There will always be a need for a practical effects department, as long as the movie has live action artists in the show. During your career you have worked with some legendary effects people: Joe Johnston, Dennis Muren, Phil Tippett, Richard Edlund….just to name a few. What are the most important things you have learned from your colleagues? Of course working alongside the likes of Richard Edlund, Phil Tippett, Dennis Muren, and Joe Johnston was truly a pleasure, and I have always had a wonderful cooperation with all these 'wizards' of the CGI world. I would like to think that the assistance and cooperation has gone both ways. What is your favorite scene of all the movies you did, and which scene was the most fun to do? I think it has to be the opening sequence of Raiders of the Lost Ark. The rolling ball chasing Harrison Ford, and all the other mechanical and pyrotechnic effects are to me the most memorable and exciting in the publics mind. What are you doing these days? Can you tell us something about your current and future projects? I am at the moment budgeting and breaking down a script of a World War II movie, with lots of battle scenes, to be shot in Eastern Europe. Of course all will depend on the 'green' light', with the money.